The air was charged and the continuous chant of ‘Hare Krishna’ was getting louder. The drums beat, the devotional songs played amidst chant of bells and air laden with the fragrance of flowers and incense engulfed us. Suddenly, the curtain was raised and the breathtaking sight of Lord Krishna’s idol came into the view and many devotees prostrated. The venue was the Dwarkadish temple at Mathura. Delhi has several attractions in the vicinity. One of my favorites has been Mathura and Vrindavan and has been visiting these places from my early childhood. The major draw to these places is temples dedicated to Lord Krishna, as it happens to be the birthplace of the lord. Over the years that I have been visiting, it appears that the time has stood still in terms of the lives the people lead here. The changes due to the technology like a mushroom of mobile towers, polluting vehicles, and mobile phones everywhere are all pervading, but the roads are narrow, the streets littered and the ‘pandas’ making a kill as soon as one is near the vicinity of a temple, has not changed. 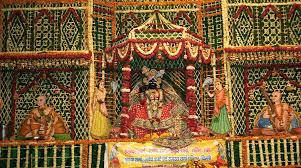 The place is not for the faint-hearted, and as long as one is willing to rough out a little, a glimpse of Lord Krishna at the Dwarkadish Temple or the Krishna Janmabhoomi among a score of other temples is delightful. The marketplace from Holi Darwaza, to the Dwarkadish temple, is lined with sweets, chat, and curio shops besides ware for daily use. It is overflowing with people most of the time and the rickshaw pullers, cows, motorbikes and the pedestrians compete hard to make way in the narrow cobbled streets. The monkeys in the city can be a nuisance sometimes but as long as one guards himself well and do not offer them eats, it is fine. If possible, one should avoid a visit to these places during the festive time as the rush is tremendous and the jostling is definitely a not pleasant experience. The river Yamuna flows quietly adjacent to the several ghats of which Vishram ghat is the most prominent one. In the evening, one can witness the ’Aarti’ being performed by the banks of the river and is always a memorable event. One of the most striking things about the town is the good quality of sweets and savories available at almost every nook and corner, especially the cardamom flavored ‘pedas’. 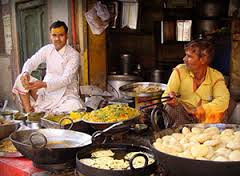 One can have a lovely spread of‘ Jalebi and Kachori’ at breakfast for less than rupees Fifty. A short ride to Vrindavan which is just about 20 km away from Mathura is always fascinating. The place is dotted with several temples dedicated to Lord Krishna. One has to make sure to reach there early as later in the day most of these temples close for the entire afternoon and open only later in the evening. Some of the most visited temples are the Banke Bihari, Rangji, ISKON, and Birla temples. Each of these temples is well worth a visit and the peace and tranquility beside the beautiful décor leaves spellbound. If you are planning a weekend trip to Mathura and Vrindavan, do add Bharatpur to the itinerary. The Deeg Palace and the fort, besides the renowned Keoladeo Ghana Bird sanctuary, will not disappoint. A number of other short trips to the adjoining Barsana, Baldeo, Gokul and Govardhan famous for temples and tales connecting Lord Krishna’s life are also worth a visit. Delhi has several modes of transport like luxury buses, taxis and superfast trains connecting the destination. So do make a trip to this temple town, if you happen to be in Delhi next time! Thanks for reading, Jaishree! Its a nice place. I had visited Vrindavan, Banke Bihari, ISKON etc. 4 years back on our way to Vaishno Devi. It was dirty everywhere. You didn't mention about the pan marks. Somebody spit from the bus on my shoulder. I felt dirty for many days. We visited Bharathpur bird sanctuary, last month. And the park too. Am going to write about it soon. Now have written about Dharamshala visit. We had been to Bharatpur before that. Dharamshala cricket match! It is sad but I agree that people around these places are uncouth and care little for cleanliness! Look forward to read your post on Bharatpur!